Reese Barrick was born and raised in the town on Osage, Iowa. While growing up, his two favorite activities were swimming at the pool and shooting hoops at his home in his driveway. After high school he attended Cornel College in Mount Vernon, Iowa, where he received his undergraduate degree in biology and geology. 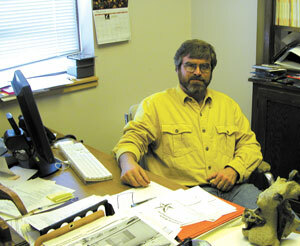 From there he attended University of Southern California where he studied paleontology and received his graduate degree. While attending college he was involved in many activities. He was on the football team, a part of Tri-Beta (a biology honors society), the geology club, Mortar Board Honors and a social/service organization called Phi Kappa Nu. Barrick went on to teach at Cal State in Damigas Hills, Calif., and taught for ten years at North Carolina State University. Then, he moved to Utah and began his teaching career at CEU. Barrick said, “I came here because there are dinosaurs here and it was a great opportunity to teach as well as do research and work in the museum. When asked where his favorite place to live was he replied Price. “I have always thought that Utah is one of the most beautiful states in the country.” His favorite places to visit are his family in Iowa and Vermont but also likes the time that he spent in South Africa. His favorite types of movies are action, comedy and science fiction; his favorite movies are The Godfather, Jaws and The Lord of the Rings. His favorite program on TV is Monday Night Football, Nova specials and the West Wing. His favorite books are The Lord of the Rings, Catch 22 and One Flew Over the Cuckoo’s Nest. He also said “I am very impressed with the theatre department here and I try not to miss any productions they put on.” He also likes musicals such as South Pacific. His favorite hobbies are hiking, playing his trumpet in the wind symphony at the college, but most of all, playing with his daughter. “I like having the opportunity to talk and share with students when they get a new perspective of the world while talking about my favorite topic, the history of the life,” he said. He likes teaching at CEU because he actually gets to know his students and they are not just another number in the class. He can also go to sporting events, activities and productions. Barrick likes Price because of the location, it is easy to reach the mountains as well as the desert. He also like the people he works with at the college as well as the museum.